Algonquin College had gone into the admirable business of keeping us clean — and it’s getting the job done using leftovers. It began with a few teachers and students from the Algonquin culinary program wanting to reduce waste. In true nose-to-tail spirit, which seeks to use every bit of the beast (including its wasted fatty bits that are skimmed off the top of a consommé in the making, trimmings from pork roasts, fat rendered from roasting duck, and discarded chicken fat), the school has begun making soaps. With previously unwanted and unloved fats rendered from cooking classes, and now accepting donations from other sources (“Bring Out Your Fat!”) the school purifies the fat — boiling it, straining it over and over again until it’s squeaky clean — and then delivers the tallow to the Purple Urchin, a Somerset Street soap company which in turn adds lye and scented oils and spices, or coffee grinds for a bit more spit and polish, based on recipes created in conjunction with the culinary school. 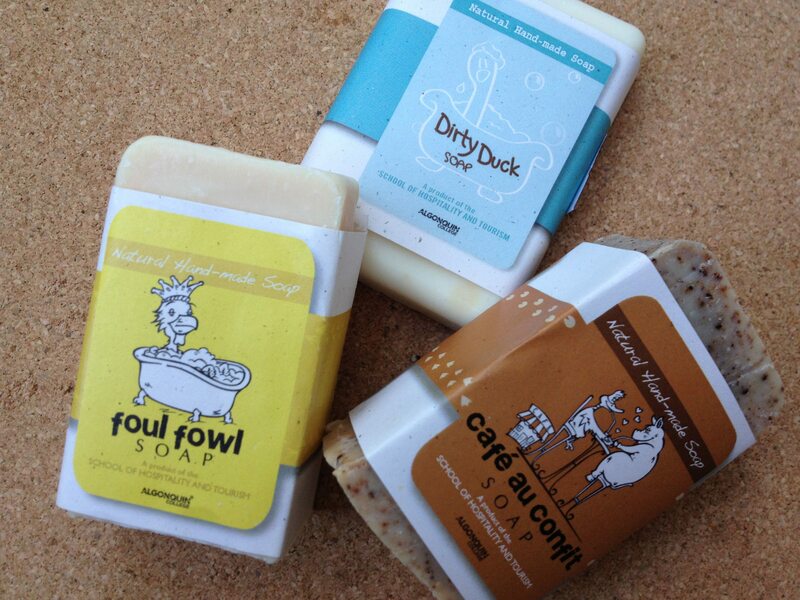 There are now seven sorts of soap, based on pork, duck, chicken, and beef fat. Make a pretty nifty host gift, imo. You can buy the soap online at dirtyducksoap.ca, at a couple of places on campus, as well as at The Red Apron (which donates fat to the endeavour), Peches & Poivre, and at Thyme and Again.